Detailed Info: Click on the 'Customer Reviews' tab to see what others have said and to submit your own reviews. The 'Related Products' tab, where present, suggests other products that may be helpful in conjunction with this one. Scroll down to select any options and to add to your shopping cart. Beefy Bridge Ground Anchor Discounts Apply ! New! 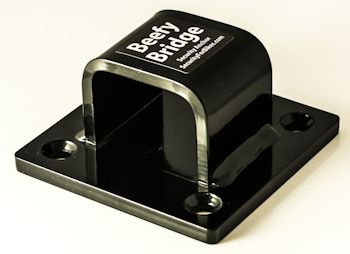 Beefy Bridge Ground Anchor - Easy DIY fit with a wide choice of fitting kits. Spring price promotion: £5.00 discount (inc VAT). Discount included in the price shown here. Limited time only - Grab one quick! Sold Secure Ground Anchors Gold approved. UK Police Approved under the Secured By Design scheme and thus suitable for installation in building projects under the Code for Sustainable Homes. Fitting kits for Concrete Floor, Brick Wall or Van (shown in photos 2, 3, and 4, respectively). Also injection resin kits for more demanding situations. Drill bit: 12mm diameter included for Concrete Floor/Injection Resin, and 16mm diameter included for Brick Wall kit. SDS-Plus drill available at extra cost. No drill bit included in Van kits. Lots more technical information here. Beefy arrived the next day, I was given an arrival time, which was spot on. Another quality product - sturdily made, tidy welds and thick powder-coated finish. Everything you need to install is in the box, all you need is your hammer drill, PPE and a dustpan and brush!